I was born in Belfast N.Ireland in 1945, just after the end of the Second World War. 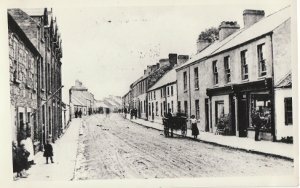 My Father was a shop-keeper, and when I was around 11 years old, we moved to Comber, Co.Down to live above the shop. Having been really very un-academically minded, I left school at the first opportunity, and set out into life with a very carefree attitude indeed. My big passion in life at the time was playing the banjo, and any job I had was merely a method to fund the banjo playing. I wanted, with a desperation, a Paragon banjo – because this was the banjo played by Barney Mckenna of the Dubliners , who was my hero. 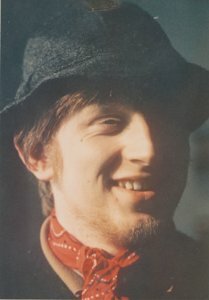 Eventually in the late 60’s, I did get my Paragon, by borrowing the money from my Father . I really loved this thing, and most of my spare time was spent practising and learning new tunes. I had a little room at the back of the house which was mine alone, and here I played my banjo and also painted a little bit. 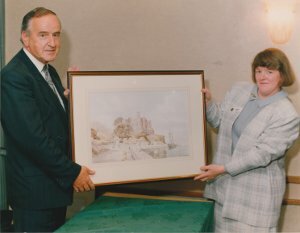 My first sale of a painting was to my Auntie Jean. She paid me 10 shillings (50 pence in today’s money). I am fairly sure that painting will not have rocketed in value !!! In my late teens, I went off to Iceland to work in the Fish Factories, complete with banjo and a change of clothes. I believe the plan was to go there ,work hard, and return home with lots of money. Sadly, it didn’t work out that way – I came home with no money. So, it was back to working at any job I could find for a while. At this time, my interests expanded a little into Taxidermy. I was fascinated by the idea of setting up a bird or mammal into a realistic pose. As this interest grew, I became quite proficient – so much so, that when a position for the taxidermist in the Ulster Museum became available , I was given the job. I am happy to say that a good few of the specimens on show in the Ulster Museum are my work. 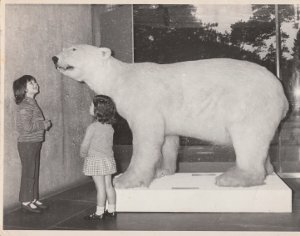 I suppose the job which gave me most satisfaction there would have been the setting up of Peter, The Polar Bear – a project involving many sleepless nights, but which nevertheless had a very successful outcome. During all this time, I continued to paint. It really didn’t occur to me that it would be possible to paint as a career, and in fact, it was quite a few years before circumstances were such that I was able to take this step. In the late 1980’s I made the decision to paint professionally. I have been very fortunate in that right from the outset, people were happy to buy my paintings. Initially, I painted from my home in Comber, and this was the Watercolour Period. In 1998, I went to live in the West of Ireland. This was a wonderful opportunity for any painter. The light and the ruggedness of the landscape were truly inspiring. I love the fact that many of the old skills, such as turf-cutting and small scale farming, with just a few cattle or sheep, are still very much a part of the way of life in the West of Ireland . I had always used a delicate palette in my watercolours, but this seemed to be inadequate to capture the wildness of Donegal. I found at this point that oil paints were more appropriate, and so began the Oil-Painting Period. During this time I was offered the opportunity to illustrate a story for the book 'Magical Tales of Ireland' published by Random House. The story was called 'Wherever ' and was written by Kate Thompson. - I was fortunate to have the ideal model in my little neice Catherine . Now, once again, working and living on the East Coast – I find that I paint either in oils or watercolour as the mood takes me. I still play the banjo, with my friends John and Matt. We call ourselves U3, but you will not be able to find any of our music for sale, as no Recording Company has offered us a contract ! Although it is said that artists never retire, I believe the time has come as I approach retirement age, to acknowledge the many people who have been of help to me in my career. Firstly, to all of you who have bought my paintings, both private collectors and Public Bodies in Ireland, the UK, USA, Canada and Japan – Thank-You, and I hope they are still giving you enjoyment. 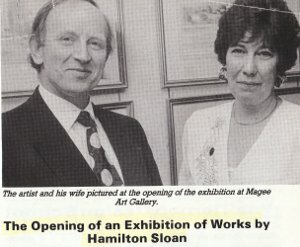 To those who were of great help in the early days, especially Bill Morrison of the Cleft Gallery, Roland Millar of the Magee Gallery and John Suittors of the Wellington Gallery – Thanks. To the galleries which still handle my work, www.eakingallery.co.uk and www.throatlake.com and many others – Thanks. To Philip and Lynne and Roger and Julie. No-one could ask for a better family. And, of course, to my wife Irene who has stuck with me through ‘thick and thin’. Thanks, Irene, I couldn’t have done it without you.